Fantastic Beasts and Where to Find Them review: "Enough thrills and genuine chills to satisfy"
Doesn’t quite enchant like the best Potter movies but there are enough thrills and genuine chills to satisfy. 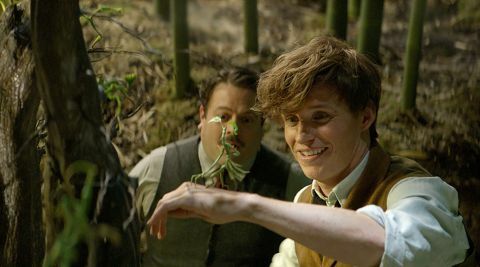 Unfortunately for Newt, some funny business involving likeable Muggle Jacob Kowalski (Dan Fogler, pretty much stealing the movie) and a suitcase switcheroo leads to some of Newt’s creatures springing the clasps on their Tardis-like home and hightailing it into a city already on red alert. This great escape draws the attention of Porpentina Goldstein (Katherine Waterston), a former ‘Auror’ (Dark-wizard catcher) who is now out of favour at the Magical Congress of the United States of America (MACUSA), and she in turn reports it to Director of Magical Security Percival Graves (Colin Farrell) to curry favour. Overall, what has emerged from Rowling’s sorting hat of ideas isn’t quite as fantastic as we all hoped. But it is an exceedingly solid franchise-opener that builds a new world with enough bridges to the established Potterverse to keep the devoted happy. The second instalment, we’re promised, will travel to the UK and Paris, with Grindelwald coming to the fore and a young Dumbledore (Newt’s only ally when he was expelled from Hogwarts) stepping into play. We can also expect, at some point, to visit America’s School of Witchcraft and Wizardry, Ilvermorny, while the spectre of World War 2 looms large.